Congratulations, B. Ansellem, staff photographer for 20 Minutes Lyon (the best damn free newspaper jammed into my hands when I get on the Metro in the morning)! Exactly how I would have done it, if I (1) had any idea what I was doing behind a camera, or (2) wasn't too chicken to take pictures of beggars on the street. "She is perfectly still. The river of humanity that is the rush-hour crowd along La Re parts and eddies around her like a rock in a stream. In my imaginary photograph, the colors and faces of the passersby are blurred by motion, while she remains in sharp focus." B. Ansellem, I salute you. Sorry I had to cut & paste from a .pdf into MSPaint, then save as a jpeg. More real content coming soon. Christmas rush + sick baby + deadlines at work = no time for blogging. Ever try to cram a 6-foot Christmas tree into the back of a rented Renault Megane? Didn't think so. No wonder the French tend toward these little shrimpy tabletop Charlie Brown trees. That is a great photo to go with your text; I expect B Ansellm's text wasn't nearly as nice. Where did you find a 6' Christmas tree anyway? I'm impressed you made the effort. Not only did M. Ansellem not mind intruding into the scene, he went all the way and took it with a spot flash... testified to by the fully lit sign board and flare on the guy's jeans. In this case your written description is more descriptive and mood setting than the photo. You ought to consider writing for a career. We'll think of your 6' tree as we eat our traditional holiday macaroni & cheese. The photo accompanied a fairly boring four-paragraph piece about how due to the recent cold snap, the city was opening additional space in its homeless shelters. 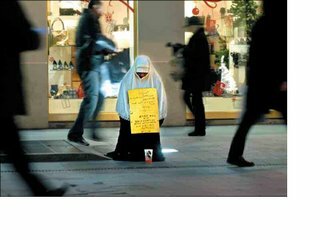 I don't think this woman is actually homeless--just poor--because I never see her at night or in the early morning, unlike the guys who sleep on the steps of FNAC every night. You know... I think the story here is not her circumstance but rather your reticence to intrude contrasted with the "what the hell" attitude of the journal photographer. How does one balance a questionable "need to know" against respect for an individual's privacy... even a street beggar's? I'll look for your short story, "The Madonna of the Sidewalk".